Last night we celebrated Jordan's time at HOFWs. Jordan has been a great asset to HOFWs, and we are all sad to see his big smile, hardwork, and downright enthusiasm go. I have a sneaking suspicion that this won't be the last we see of Young Jordan! We commemorated the occasion with a Factory 99 feast, complete with copious amounts of Italian (and one Spanish) wines of several varieties. We started the evening with a platter of fried variety; calamari, fries, potato skins, chicken wings, fish, and paired it with Vallformosa Reserva 2009 Vintage Cava. This Spanish sparkler was an alright start to the evening. The quick bubbles left more to be desired. Next up was fresh out of the oven rosemary bread, followed by a big shrimp, mango, dragon fruit, almond salad with mayo dressing. 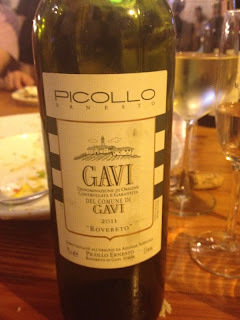 We enjoyed three white wines during this course; Carlin de Paolo Roero Arneis (Vendemmia) DOCG, Carlin de Paolo Chardonnay, and Gavi Roverto DOCG. 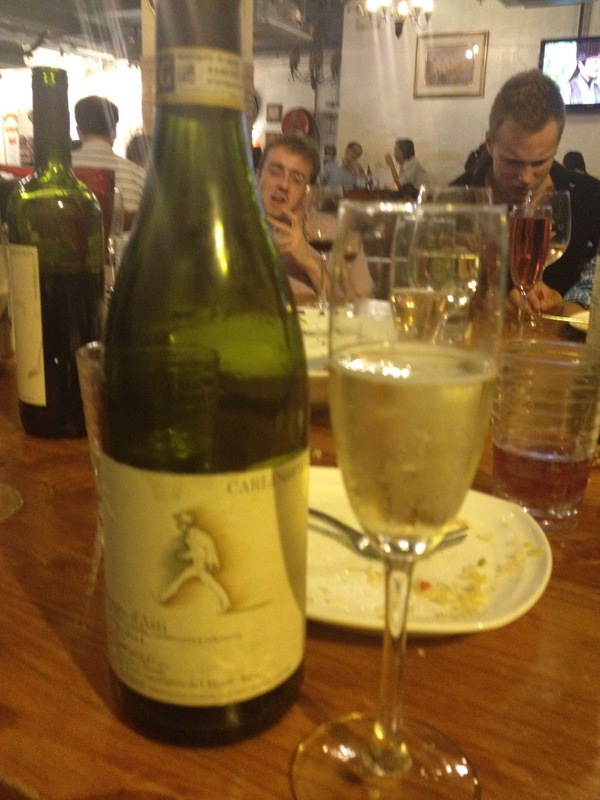 We were all sampling the Carlin de Paolo wines together for the first time, and the overall reaction was good! I especially enjoyed the Roero Arneis, which was light and floral in flavor and the crips acidity broke the heaviness of the creamy shrimp salad. The following course was a seafood fried rice in which we continued to enjoy our white wine selections. This is where the Picollo Ernesto Gavi Roverto popped. The rich body with the apricot and floral flavors were wonderful with the buttery fishy, squidy, muscley fried rice. Onto the meat! 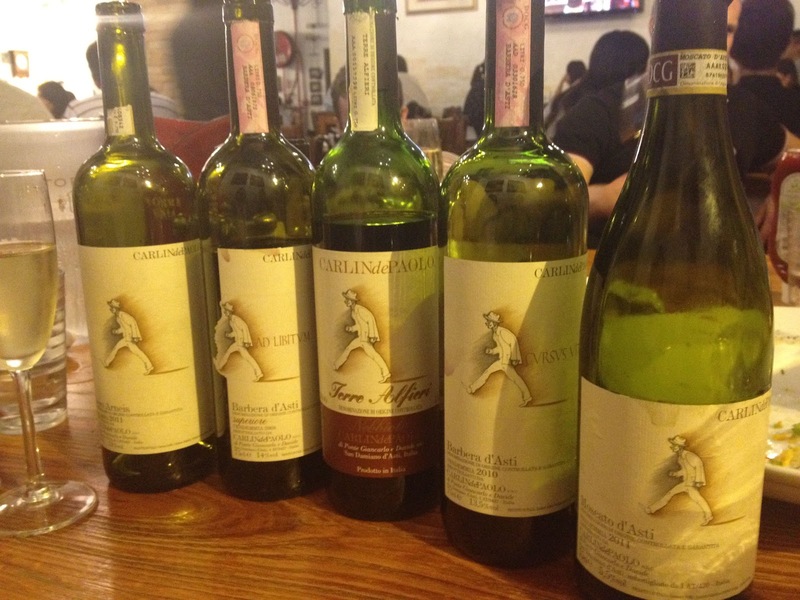 Beef tips were enjoyed with our selection of Italian reds. Carline de Paolo Terre Alfieri 2009 DOC and CdP Barbera d'Asti Superiore 2008 DOCG. The former being Nebbiolo and the later Babera. The Barbera was so much softer (but still quite tannic! 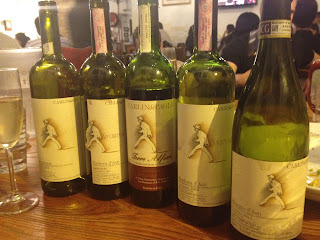 ), whereas the austere 2009 Nebbiolo expressed more vanillan flavors. I liked the first until I tried the second, and then there was no going back. The sour cherry of both of highlighted the simply cooked peppered beef. And the grande finale, and my personal favorite of the evening (I think me sucking down 2/3 of the bottle is a testament to this statement), was the Carlin de Paolo Moscato d'Asti 2011 DOCG. Never one for sweet wine, I moved to Korea where you don't have much of a choice. I'd say at least 1 out of 10 wines you picked ended up sweet, whether labeled so or not. I made it my perogative never to buy a wine less than 13%, as I figured this would safeguard me from the semi-sweets of the world. Alas, something must have stuck with me, for now in Hong Kong I crave sweet wines and I find it quite difficult to find them! Where's Emart when you need it!? But this Moscato was lovely. Sweet, but with balanced acidity, it expressed lavendar soap (in a good way! ), apricot, lychee, and passion fruit flavors. Truley lovely, and with its 5.5% booze level it won't have to be the end of your evening!